A total site redesign is a tricky thing. At some point, you must redesign your site, but when you do, you run the risk of your traffic dropping off. Redesigning a site is one of the biggest SEO challenges that a company can face. What’s going to happen once the site is officially launched? What will happen with any 404s? How will the site perform in the search engines? What about existing links to nonexistent pages? SEO should be part of the redesign process – designers, developers, and SEOs should regularly interact with each other during a site revamp. SEOs often see things from a traffic perspective that an information architect, developer, or designer might miss. Don’t rush the launch – I’ve seen some of the world’s biggest brands and websites completely miss crucial SEO steps because they were trying to meet a deadline. If the deadline is more important than maintaining search traffic, then there is something wrong with the deadline. Do not place unreasonable deadlines upon a site launch. Now that we got that out of the way, let’s get into the redesign process. While you are redesigning your site, you need to keep a few things in mind. Some of these things may not seem important to you, but leaving any of them out is an easy way to cause a huge traffic drop. At no point should you pull your old site offline unless it needs to go under for a few minutes as you launch the new design. When visitors encounter a website that says “sorry, we’re under construction” for several weeks, traffic declines before the new site goes live. A site redesign is the perfect time to evaluate your existing keyword strategy. Take a look at your organic keyword traffic, and find out if your site could be gaining traffic from any new long tail keywords. If so, then you should roll this research into the new site redesign. You may want to create new categories based on these keywords. If you can, keep your URL structure the same. Whenever you change a site’s URL structure, you lose vast amounts of traffic from inbound links. To remedy that, you will have to conduct a massive 301 redirect mapping campaign. The biggest site launch mistake I’ve observed is altering the URL structure without implementing 301 redirects. You are using a new platform or CMS that requires a different structure. Often, switching to a new system for website administration and content creation is a great choice. If you do, you may have to change your URL structure. You are completely reconfiguring your entire sales or search approach. Sometimes, a site redesign is called for because your business is changing strategy. Maybe you’re adding a new product line, acquiring a new business, or rebranding entirely. In this case, you’ll need a fresh URL structure. Your existing URL structure is downright bad. This is probably the most common reason for a URL structural change. One of the best ways to restructure your URLs is to do it according to organic query patterns. If your current URL structure does help your long tail traffic, then you may need to come up with a URL structure that is better optimized for SEO. Don’t use 302s – 302 temporary redirects are not recommended. They do nothing for SEO and are only a short-term fix for what should be a long-term strategy. Don’t delete pages – deleting pages is not a good idea. If you don’t like a page, you can change the content of the page, or you can redirect it to a different page. The rare 404 case – there are some rare cases in which you may not want to 301 a page, e.g., if a large collection of highly toxic links was targeting that specific page. If this is the case and the page is not a critical landing page, leave the 404 error there and do not redirect it. When you redirect a page, it transfers both negative and positive link juice to the root domain. If you leave it with 404, the toxic juice will have a limited impact on the rest of the site. Since the new site will probably experience a few 404s, you should have an optimized 404 page in place. What many developers don’t realize is that a 404 page can be a great tool for marketing and/or keeping users on the site. Check out this 404 technique for creating more indexed pages, and check out this site for creating a compelling 404 design. When you’re sure everything is ready, place your analytics tracking code in the page source. Any conversion landing pages should also be tracked with the relevant codes. You will need data once the site is relaunched. If you forget to put in your tracking codes, you’re going to lose the chance to analyze the performance of the new site. Launch Time! Flip the Switch! Remove all indexing restrictions (robots.txt) on the dev site – adjust your robots.txt to allow your new site to be crawled. Make sure you’ve specified the location of your sitemap in your robots.txt. 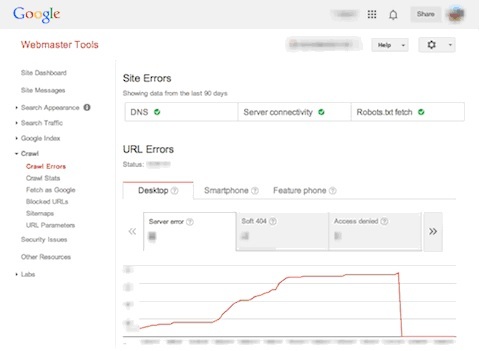 Submit your new sitemap to Google in Google Webmaster Tools – go to Google Webmaster Tools > Crawl > Sitemaps. Add your new sitemap to allow for the indexing of the new site to begin. Once the launch is complete, you enter a new, very important phase: watching your traffic and rankings. Keep a careful eye on your analytics during this time. Your goal is to find any unusual traffic drops, sudden 404 spikes, or keyword ranking losses. Below are three critical points to monitor. You can accomplish these tasks through Google Webmaster Tools. Keep an eye on how things are indexing in Google. You want to make sure that Google is indexing your entire site. Once your site is launched, watch this page like a hawk. If you see pages 404ing, make a list and fix them. Traffic is a critical metric for measuring the success of your new site’s SEO. Keep close tabs on everything that happens with your traffic patterns. Look at the charts below. They reflect two different outcomes of a site redesign process. 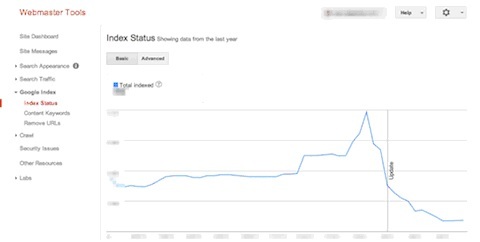 One site experienced a plunge in traffic at the point of its redesign. It was able to regain most of the traffic shortly after. Another site had a total loss of traffic due to a complete mismanagement of the site’s SEO. It did not regain its traffic. If you follow the instructions in this post, your site will not suffer the fate that you see in the chart above. Sure, you’ll experience a bit of fluctuation. Every site does after a redesign – it’s inevitable. I’m convinced that a careful and intentional site redesign will allow you to sustain 95% or more of your site’s existing traffic. A big drop doesn’t have to happen. Plus, if your site redesign is rolled out successfully and your new design is better, then you’ll actually see your traffic rise.